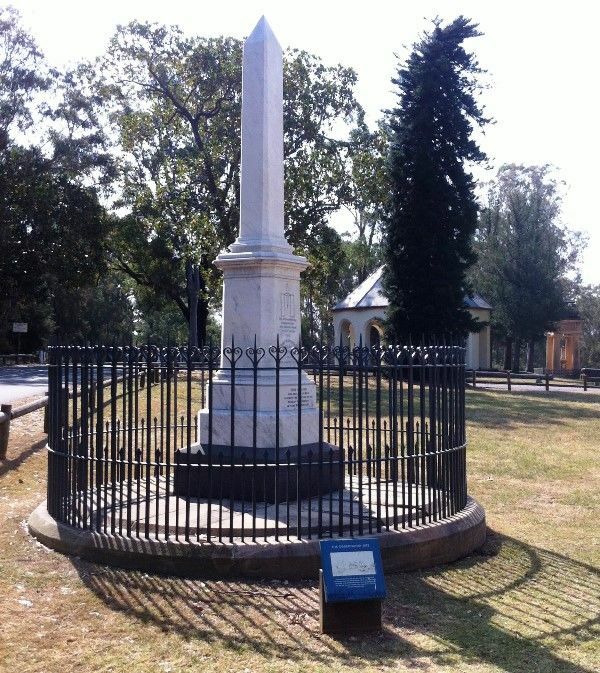 The obelisk erected in 1880 marks the site of the astronomical observatory founded here on the 2nd May 1824 by Sir Thomas Brisbane , Governor of NSW. Sir Thomas Brisbane was a battle-scarred soldier with a distinguished record of military service in many parts of the world. He was a scientist as well as a soldier, being a graduate of the University of Edinburgh and during his many sea voyages he became interested in navigation and meteorology. In 1821 he established at his own expense an astronomical observatory at Parramatta, a few miles west of Sydney. In 1847, the observatory was closed, and the building became dilapidated and was demolished in 1876. In 1821, Lieutenant-General Sir Thomas Makdougall Brisbane, K.C.B., having been appointed Governor of the colony of New South Wales, resolved to avail himself of the opportunity thus afforded for promoting astronomical science in the southern hemisphere by causing an observatory to be established at Parramatta. With this view Sir Thomas Brisbane made a collection of astronomical books and instruments, and engaged two gentlemen— Mr. Charles Rumker and Mr. James Dunlop — to act as astronomers at the intended observatory. 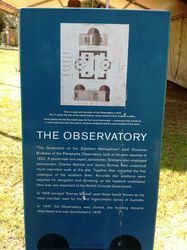 On his arrival in the colony in November, 1821, a situation was fixed upon for the observatory near what was then Government-house, in Parramatta, and there is no doubt that his desire to assist in the work himself, and look after it, induced him to place the observatory so close to his residence. The building was begun as soon as possible, and finished on May 2, 1822. It measured 28ft on each side, and had a flat roof, above which were two domes 11 ft 6 in in diameter, one on the north side, the other on the south ; under those domes the walls were curved so as to form half of a tower. In each of these curved walls were three windows, the only lights in the observatory. The instruments consisted of a 5½ft transit instrument, by Troughton ; a 2ft Mural circle, by the same artiste, a 16in repeating circle by Reichenbach, and a 46 in equatorial, a clock by Hardy, and another by Breguet. The whole cost of this equipment was borne by Sir Thomas Brisbane, but was repaid by the colonial Government when he left the colony. Mr. Rumker finally left the colony in 1829, and Mr. Dunlop was then appointed aatronomer, a position which he continued to hold until 1842. The instruments were then removed, and the building allowed to fall out of repair. When Parramatta Park was placed in the hands of trustees, the old observatory was pulled down and trees planted on its site. 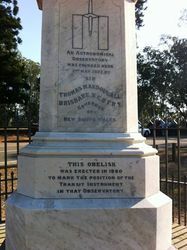 A great number of valuable astronomical observations were made at Parramatta, and it is important to mark the exact site of the transit instrument with which those observations were taken ; so that at any future time when it may be necessary to use the observations, the geographical position in which they were made may be determined with all the precision which the then existing state of astronomical science may render possible. At the instance of Mr. J. S. Farnell, M.L.A., a sum of £150 was placed on the estimates, and voted for the purpose of erecting a suitable monument to mark the site of the Parramatta Observatory. The following gentlemen were appointed trustees of the work:— "Mr. James Squire Farnell, M.L.A., Mr. James Barnett, Colonial Architect, Mr. H. C. Russell, Government Astronomer." 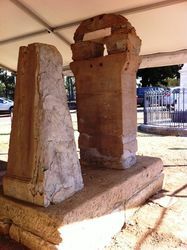 In execution of their trust, they have erected a veined white marble obelisk, exactly in the position occupied by the transit instrument in former years. On the east side of the obelisk an outline diagram of the transit instrument has been engraved, and the following inscription :— " An astronomical observatory was founded here May 2, 1822, by Sir Thomas Makdougall Brisbane, K.C.B., F.R.S., Governor of New South Wales. This obelisk was erected in 1880, to mark the site of the transit instrument in that observatory. Australian Town and Country Journal (Sydney), 3 April 1880. An astronomical observatory was founded here 2nd May 1822, by Sir Thomas MakDougall Brisbane K.C.B.F.R.S. This obelisk was erected in 1880 to mark the position of the transit instrument in that observatory.